This week the College said goodbye to Mr. Diarmuid Fitzgerald who has taught here for 37 years. During his long service Mr. Fitzgerald taught Business, Maths, Computer Studies, Religion, CSPE and SPHE. Mr. Fitzgerald also coached and managed many rugby teams, adjudicated at our in-house public speaking events and was a great support to the music department; he played with the College orchestra for our annual music events – the Carol Service, the concert in UL and the College Opera. 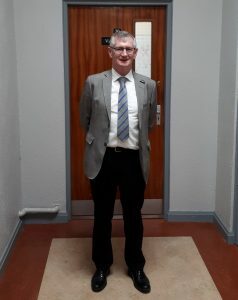 Mr. Fitzgerald supported the College ethos fully, he demonstrated its’ values in his daily practice during his interactions with the staff, students and parents. He always showed great respect to all of the College’s stakeholders and he will continue to be held in the highest esteem by all of them. Last week he gave his weekly address to the student community at Morning Prayer and he told them of his intention to retire. He spoke about how much he enjoyed his years in the College and thanked them very sincerely for contributing to that enjoyment. He wished them all well and told them that he would continue to visit them. The boys responded with a sustained applause. We are all very grateful to Mr. Fitzgerald for his phenomenal service to the College in so many areas and for the warmth, respect and care that he showed to all of us. We wish him a long and very happy retirement with his family and friends.